Cameroon is spiraling downward, with fighting between rebels in the Anglophone regions (the Northwest and Southwest regions) and President Paul Biya’s security forces intensifying. At a briefing before the UN Security Council (UNSC) on December 13, the U.S. deputy permanent representative to the UN, Ambassador Jonathan Cohen, urged the Biya government and the Anglophone rebels to begin talks. In a separate speech before the UNSC, the British deputy representative to the UN, Ambassador Jonathan Allen, announced a $3.1 million contribution from his government to the UN’s appeal for humanitarian relief in the Anglophone regions, representing 20 percent of the total appeal. The director of UN humanitarian operations, Reena Ghelani, said that Cameroon is “one of the fastest growing displacement crises in Africa.” She noted that internally displaced Cameroonians, who number almost half a million, lack adequate food, shelter, and water, and that there are at least thirty thousand Cameroonian refugees in Nigeria. 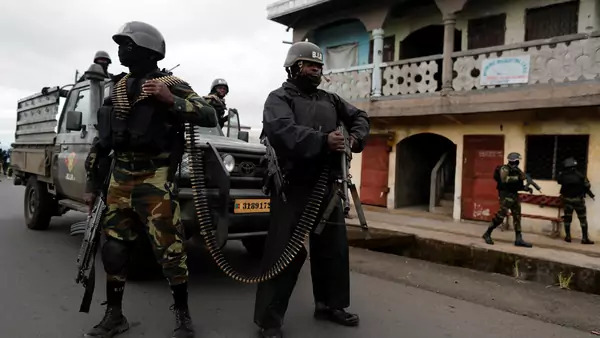 In addition to rebels, most of whom are separatists apparently seeking to establish an Anglophone republic called Ambazonia, Cameroon also faces murderous operations carried out by the radical, jihadist Boko Haram in its predominately Muslim north. Obviously, dialogue that might stop the killing in Cameroon’s Anglophone regions is devoutly to be hoped for. The rebels are splintered into many separate groups, some of which are mutually antagonistic in addition to being hostile to the government in Yaounde. Biya’s regime, notoriously repressive, has a record of many broken promises with respect to the Anglophone regions. Biya, around eighty-five years of age, recently won deeply-flawed elections in October, but already there is speculation about how the country will transition when he can no longer serve as chief of state. Under all these circumstances it is hard to see how a dialogue between the Biya regime and the rebels can begin anytime soon. Similarly, Boko Haram in neighboring Nigeria and in Cameroon shows little interest in dialogue with “secular” governments. In the short term, at least, the outlook for Cameroon is grim.